In the summer I like to grill and this is my favourite accompaniment to whatever I’m grilling. I make a big batch of it and keep it in the fridge almost every week during the summer. My favourite is to spoon it over grilled beef and veggies. 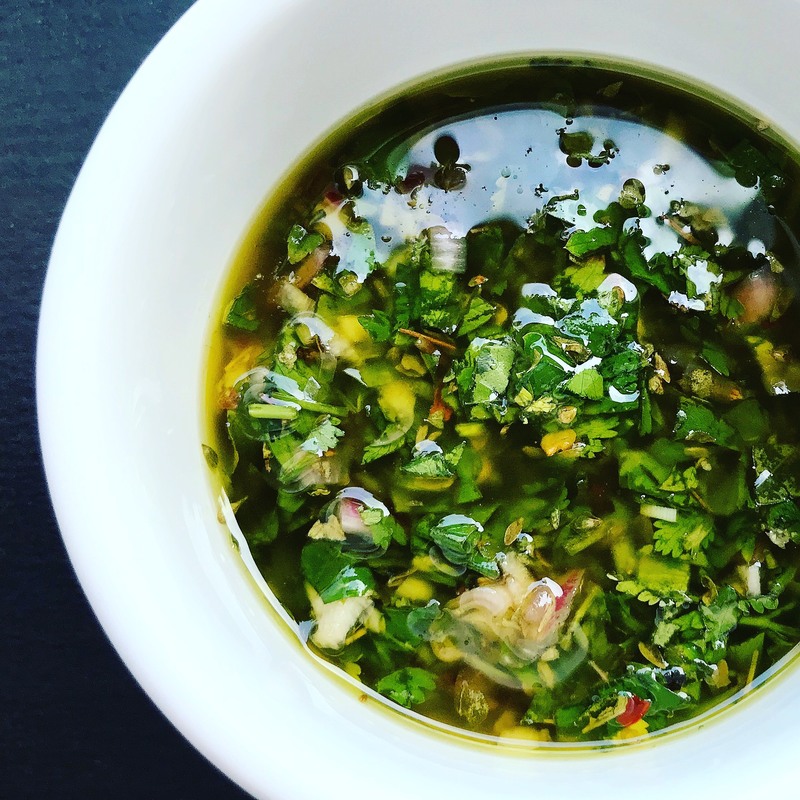 I like to chop everything so my chimichurri is a bit chunky. But you can use a food processor as well. By hand: Chop the garlic and shallots and add them to a bowl. Add the red wine vinegar and lemon juice, salt, oregano, pepper, and red pepper flakes, and mix well. Add the chopped parsley, coriander, and mint. Add the olive oil and mix well. If it’s a little dry, add another 1/4 cup of olive oil. Food Processor: Roughly chop the parsley, coriander, mint, shallots, and garlic and put in the food processor. Add the red wine vinegar, lemon juice, salt, oregano, pepper, and red pepper flakes. Pulse the mix a few times, them drizzle the olive oil in as the food processor blends the ingredients. This is so versitile, you can dress meats and seafood with it. It is also good for marinating meats and veggies. When grilling, drizzle it on top of meats and roasted veggies or you could try my Asada fries.